North and east of Verona, Italy is where Valpolicella wines originate and a little to the north of Valpolicella you find Prosecco wines. You may have heard of Prosecco, the sparkling darling of people around the world at the moment. It is not as complex or expensive as Champagne, but many people want an inexpensive, typically off-dry bubble to share with family and friends. There are different qualities of Prosecco, from the cheap and cheerful up to the drier, more expensive style of sparkling wines. Valpolicella is a completely different wine to Prosecco. It is a still wine. It is red. And it comes in a variety of styles from light and fruity to full-bodied, full of dark fruits and spices. It is remarkable that in this region north of Vento you can find two very different wines being produced. Valpolicella wine styles allow you to buy some to enjoy now, as well as to buy some to cellar and enjoy for many years. 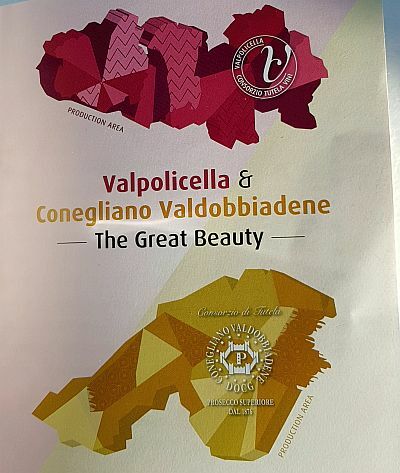 Both wines are made with different grapes; Glera for Prosecco, and a blend of red grapes, Corvina, Corvinone, Rondinella, Molinara, and Oseleta in different percentages for Valpolicella. In Valpolicella, the winemaking methods are also varying depending on the wine being made. Straightforward Valpolicella DOC would be made like any other red wine, with the grapes being crushed then fermented and aged. Amarone DOC, the fullest bodied Valpolicella is made by first drying the grapes around 120 days to concentrate the juices before being fermented then aged. The skins left from the Amarone DOC winemaking process can be added to a Valpolicella DOC to re-ferment or re-pass through fermentation. This wine is known as Ripasso DOC and has body and flavour intensity between Valpolicella DOC and Amarone DOC. There are also DOCG versions of all these wines. I could go into more depth, but maybe this is a good first step to introduce you to these wines. What helps understand wines is to taste them. I recently attended a Trade tasting where these different wines were poured. Below are a few that I quite enjoyed. You can find some in BC Liquor stores and some at private wine shops like Everything Wine. Cin cin. Bortolomiol Valdobbiadene Prosecco Superiore DOCG Brut Millesimato 2017 “Prior” – Light honey and peach aromas. Dryish with higher acidity and small creamy bubbles. Starts with almonds and light floral flavours then adds peach later on. 8g/l of sugar. Bortolomiol Valdobbiadene Prosecco Superiore DOCG Extra Dry Millesimato 2017 “Senior” – A nice stone fruit nose. Off-dry but does not feel too much. Higher acid with creamy dancing bubbles in your mouth. Apple flavour to start added by stone fruit later. Nice. 15g/l of sugar. 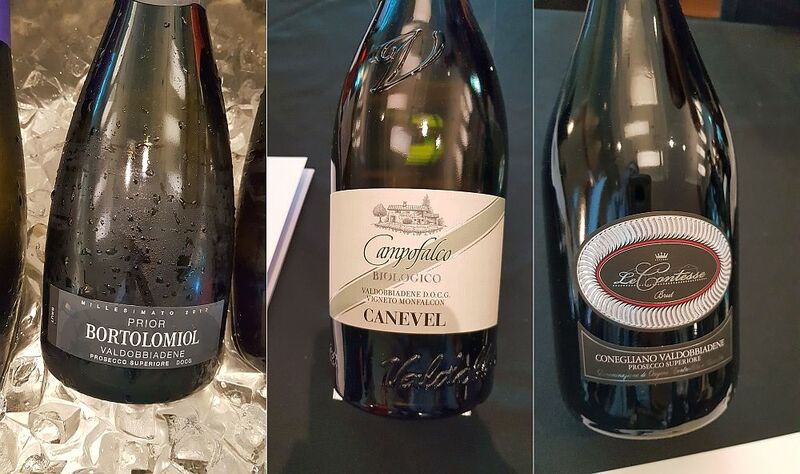 Canevel Valdobbiadene Prosecco Superiore DOCG Spumante Biologico Brut 2017 ” Campofalco” – Light lees and toast on the nose. Medium plus body, dry, with a fine creamy bubble. Stone fruits, floral, mineral and a hint of petrol on the palate. This wine is made of 90% Glera and 10% Verdiso. I am not familiar with the latter grape, and wonder if the toastiness I picked up comes from that grape, or if it the clay soil the vines are grown, as toast is not a typical Prosecco aroma. Either way a very good wine. Le Contesse Conegliano Valdobbiadene Prosecco Superiore DOCG Extra Dry 2017 – Nice sweet yellow apple nose. Off-dry with high acidity and small biting bubble, which becomes creamy later on. Apples on the palate which gets stronger on the finish where peach flavours also appear. 17g/l of sugar. Le Contesse Conegliano Valdobbiadene Prosecco Superiore DOCG Brut – Very fruity, yellow apple aroma in the glass. Dry with higher acidity. Small creamy bubble. Apple and yellow pear flavour that gets stronger to the finish. One of my favourite Proseccos of the tasting. 4g/l of sugar. Le Rughe Conegliano Valdobbiadene Prosecco Superiore DOCG Extra Dry NV “Rivaj” – Light peach nose. Off-dry with high acidity and tiny biting bubble that changes to creamy. Lots of yellow apple flavour, along with some floral and almond as well. 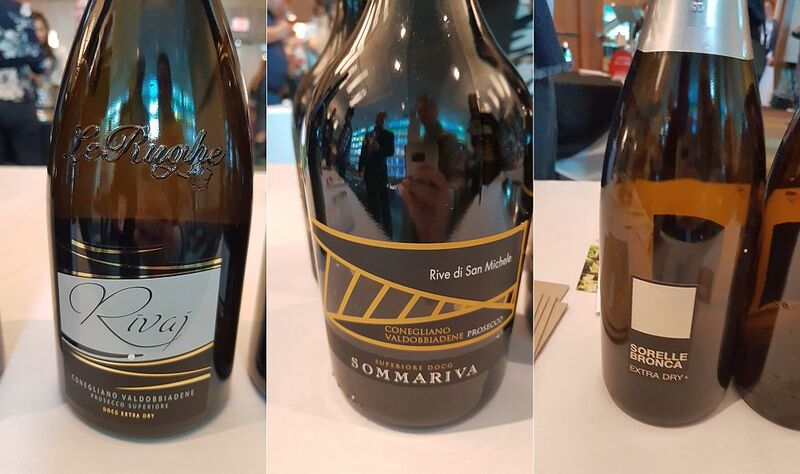 Sommariva Conegliano Valdobbiadene Prosecco Superiore DOCG Brut NV – I noted that this wine had a toasty nose, which continued to the palate. Also on the palate, there was some nuttiness to the wine and flavour of baked apple. Creamy bubble. An elegant wine. I wondered about the toastiness as that is not what you would expect from Prosecco seeing that it is not aged in oak barrels. Stainless steel keeps the fresh fruitiness of Prosecco. The owner that I spoke with told me that their vineyard has iron in the soil and it is the iron that imparts the toastiness to the wine. Other vineyards producing Prosecco have more clay soils. Something new I learned that day. A recommended wine. Sommariva Conegliano Valdobbiadene Prosecco Superiore DOCG Extra Dry 2017 “Rive di San Michele” – Very light peach aroma in the glass. Off-dry with small elegant creamy bubble. Medium minus acidity with soft stone fruit flavours. Very nice. Cantina Valpantena Verona Amarone della Valpolicella DOCG 2012 “Torre del Falasco” – Nice cedary, dark fruit nose. Off-dry, full body, round with a thick mouthfeel. Ripe black fruits, cedar, vanilla and other sweet spices on the palate. A very tasty wine. 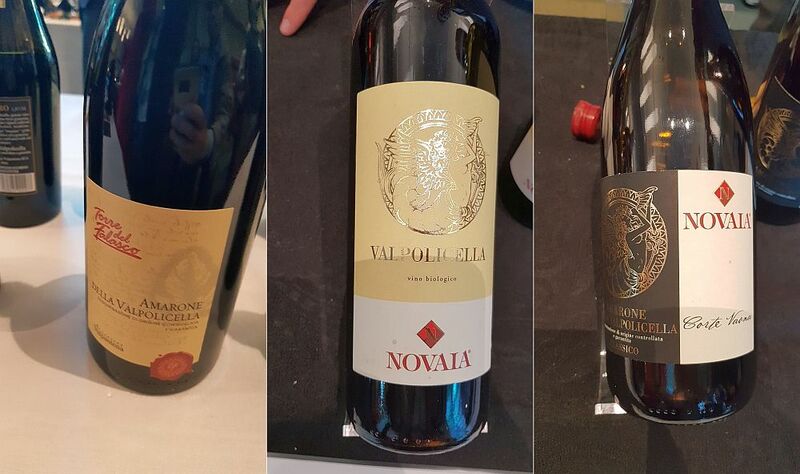 Novaia Amarone della Valpolicella DOC Classico 2013 “Corte Vaona” – Medium translucent garnet in the glass. Light woody and dark fruit nose. Medium body with ripe, juicy black fruit flavours that get lighter in the mouth later on. Some red apples and spiciness as well. Tannins firm up on the finish. Good quality. 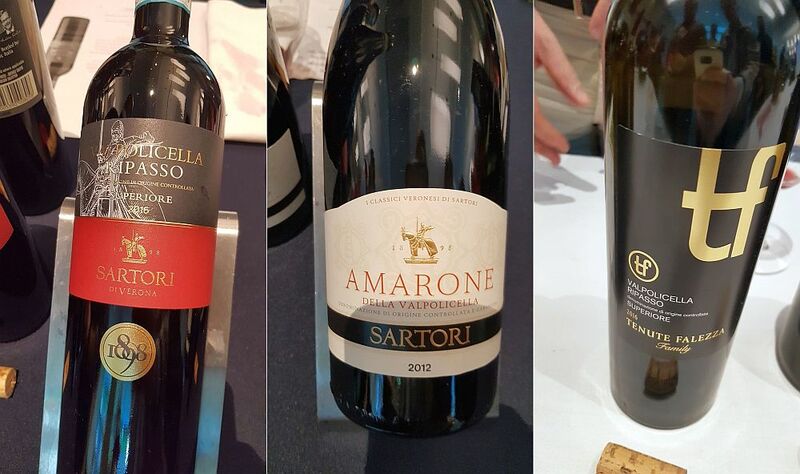 Sartori di Verona Amarone della Valpolicella DOCG 2012 – Darker garnet in colour. Old World Oak (cedar) aroma along with ripe red fruits. Fuller body with flavours of ripe black fruit, black cherries, light sweet spices and some chocolate. Light pepperiness. Sartori di Verona Valpolicella Ripasso Superiore 2016 – Light nutmeg on the nose. Medium plus body, round and dry with soft tannins. Nutmeg and ripe red fruit flavours. Easy to drink. Tenute Falezza Valpolicella Superiore Ripasso DOC 2016 – Light translucent garnet in the glass. Very aromatic red fruit nose. Medium body, with intense dark, sweet, ripe fruit flavours. Dry with firmer tannins. Peppery finish. A big intense wine.